In Dimock, PA, Victoria and Jimmy Switzer are among 14 families along Carter Road whose drinking water wells became contaminated with methane and other chemicals after gas drilling on their properties. 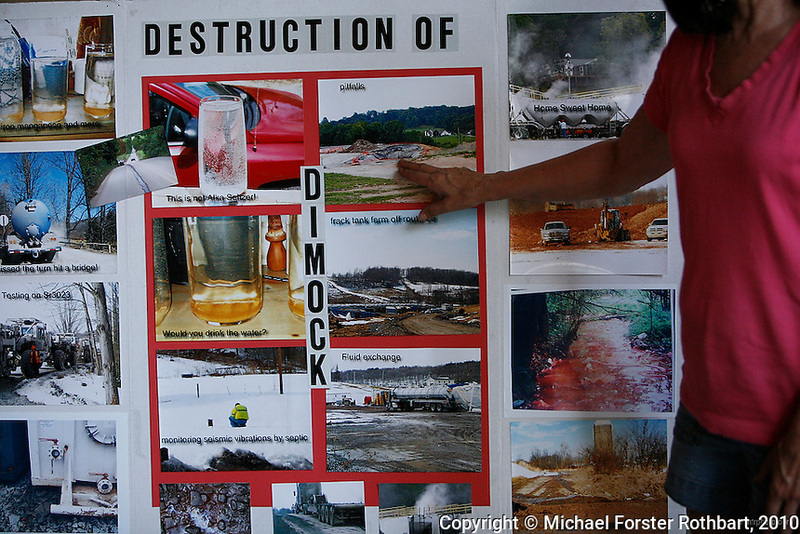 Cabot Oil and Gas, the company held responsible by the Pennsylvania Department of Environmental Protection, has had at least 21 spills in Dimock township in less than two years. "Here we're in the middle of three wells," says Victoria Switzer, "710 feet this way, 1435 feet up the hill and 1375 feet there. And that's pretty much how it plays out. There's no spacing regulations." Despite not being able to drink their water and a pending lawsuit against Cabot, the Switzers have continued to build their new family home and plan to stay. The 2005 Energy Policy Act exempted natural gas drilling from the Safe Drinking Water Act. Scientists have identified volatile organic compounds (VOCs) such as benzene, ethylbenzene, toluene, methane and xylene that have been found in contaminated drinking water near drilling sites. On the other hand, gas companies and property owners stand to earn up to one trillion dollars in profits from drilling in the Marcellus Shale.